e-Paint is a Windows paint application - unlike numerous Windows paint "programs." It's easy to use, quick to learn and less difficult to master than many brands of soap. If you're able to work the web browser that's displaying this document, you have all the necessary skills to successfully operate e-Paint. The power of e-Paint is that it embodies a rich selection of popular drawing and image-editing tools without attempting to squeeze every imaginable painting function in there somewhere, just so it can say it has them. It provides robust painting functionality, but it won't burden you with innumerable features to click through to perform simple tasks. It has a very short learning curve. It's also reasonably priced. 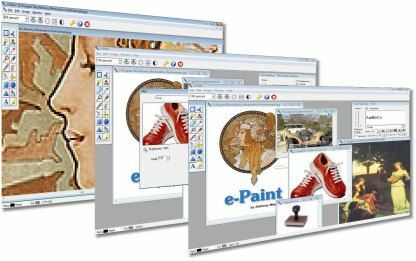 e-Paint's features include a variety of selection tools; antialiased drawing and text; a gallery of image processing filters ranging from tastefully subtle to breathtakingly wild; multiple document handling, soft brushes, local undo, variable magnification and an intuitive user interface ? you might not even need its extensive, accessible documentation and tutorials.